Voodoo Shilton at OZ Night Club TONIGHT: Wednesday, July 12, at 7pm SLT! 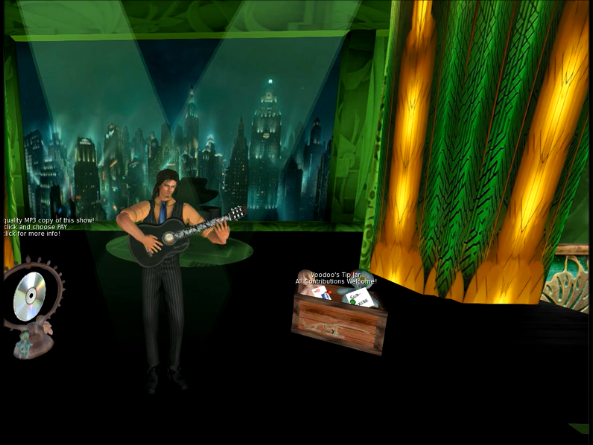 Voodoo Shilton is a jazz guitarist and live performer – join us TONIGHT, Wednesday, July 12, 7pm SLT at the beautiful art deco styled OZ Night Club for an exceptional evening of music. Formal dress, but please keep your scripts to 100 or less so we can all trip the light fantastic:) Here’s your limo! This entry was posted in Uncategorized and tagged Best in Second Life, Calas Galadhon Park, Live Music in Second Life, OZ Nightclub, Second Life, Virtual Reality, Virtual world, VOODOO SHILTON by Romie Vella. Bookmark the permalink.